At SWAN Plumbing, Heating & Air, we proudly serve the Parker, Colorado community with reliable residential plumbing and HVAC solutions. Our licensed and industry certified technicians have a combined 40 years of experience in the industry with the knowledge and tools to diagnose and fix all types of HVAC and plumbing issues. We repair, maintain, and install all types of residential heating and cooling systems and plumbing systems to keep your home comfortable and safe. We understand that when you have a problem with your plumbing or HVAC system, you want the problem fixed right the first time without hidden charges or unpleasant surprises. You can count on SWAN for honest and upfront pricing with a 100% Satisfaction Guarantee. Or, click here to schedule your Parker, CO plumbing or HVAC service online. Keep the cold out this winter with affordable heating repairs and installation from SWAN. 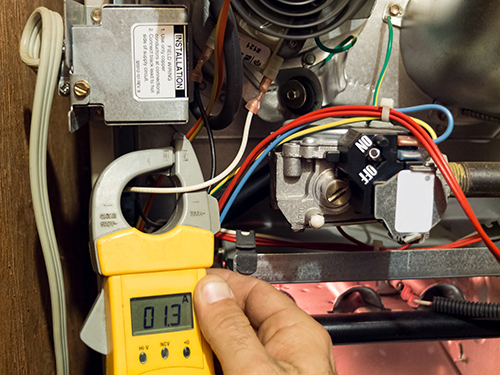 Our HVAC technicians in Parker can diagnose issues with residential furnaces and boilers and recommend repairs or replacements to keep your system working as efficiently as possible. A residential furnace can last for 15-18 years with proper care, but replacing an older unit can save you 15% or more on your energy bill. If your furnace is starting to fail or acting up, our Parker furnace technicians will diagnose the problem and give you an upfront quote for repairs or replacement. Your boiler may be getting ready to fail if your house is too hot or too cold. Our Parker, CO boiler technicians will let you know if repairs are possible or if it's time to replace your boiler. If your boiler needs to be replaced, we will help you select a top-rated brand that will lower your monthly heating costs. Our Parker AC technicians repair, maintain, and install all types of residential air conditioning systems, including wall/window units, central air conditioning, and ductless mini-split systems. Count on SWAN Plumbing, Heating & Air to help you stay cool in Parker, CO all summer long. All AC systems require repairs from time to time as parts wear down with regular use or even storm damage. Our Parker, CO air conditioning technicians will diagnose any problem you may be experiencing and give you upfront pricing for repairs. Common issues we encounter in Parker include electrical problems, low air flow, refrigerant leaks, damage to the compressor, leaking ducts, and improper maintenance. Who doesn't want to avoid repairs and lower cooling costs? The SWAN 22-point air conditioning tune-up plan can help you do both. Our affordable maintenance program will make sure your system is working as efficiently as possible ahead of summer. During the tune-up, we will look for signs of damage to avoid costly repairs down the road, clean your system, inspect your ductwork, and more. An annual AC tune-up can help you save up to 20% on cooling costs! Our plumbers offer a wide variety of residential plumbing services to fix any plumbing issues like clogged drains and leaks while keeping your plumbing system working as it should. Our Parker plumbers specialize in residential plumbing. Whether you are ready to replace your aging plumbing system with a new copper pipe system, you want preventative services like drain cleaning, or you need plumbing repairs to fix a leak or low water pressure, we are here to help. Do you have rusty water? Hot water that runs out before you're done with your shower? No hot water at all? Our Parker plumbers will get to the bottom of the problem. Many water heater repairs are affordable and involve replacing worn-out components like thermostats and heating elements. Of course, all water heaters fail eventually. Your water heater may be preparing to fail if it is more than 10 years old, makes rumbling or banging noises, or you notice water around the appliance. We will recommend cost-effective solutions to fit your budget. SWAN water heater technicians repair and install all types of water heaters, including tankless, electric, gas, and solar water heaters. Sump pumps work to remove water that accumulates in a collecting basin in the basement to keep your basement dry and prevent flooding. These small pumps are unassuming and most people don't give them much thought -- until there's a problem. Whether you are interested in new sump pump installation or your sump pump is not operating properly, our Parker plumbers are here to help with affordable, upfront pricing. For just $99 (normal price $199) we will send one of our clean cut, highly trained & qualified, drain cleaners to your Parker home and fix any problems you may be facing with drains or sewer line correctly the first visit!